Add Data Widget - prevent added layers from showing legend? Is there a way to prevent a "curated" web layer from being automatically included in the legend after it has been added to the web app with the Add Data Widget? The Add Data Widget works well and users can add any of the "curated" layers, however these added layers get automatically added to the legend although we've configured the layers to hide legends and saved the layers (Save Layer) in portal. 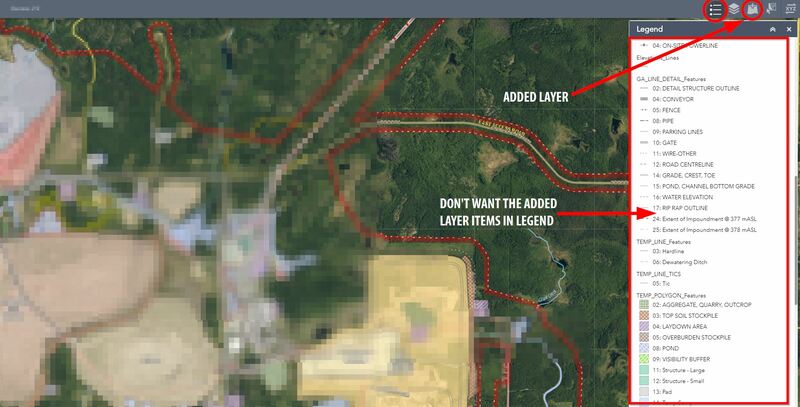 I was expecting the same behaviour as if I were to add a layer that has been configured and saved in portal to a new map - a previously saved layer inherits the hide in legend setting, popups and other behaviour. It seems when such layer is added to a RUN-TIME app via the Add Data Widget it ignores the the saved layer behaviour: shows the legend by default and ignores any custom popup behaviour. Browse other questions tagged arcgis-server web-service arcgis-web-appbuilder or ask your own question. Web AppBuilder's “Near Me” widget doesn't work with my point layer? Editing related records for layer that has been added using ArcGIS Web AppBuilder?